"Vincent has really reached (our young audience) with new and exciting ideas about wine"
Since 2000 I have been Managing Director of Vincent Gasnier Wine Consultancy (NB "Consultancy" is correct-"consultant" is a person not a company)Limited. The consultancy offers a range of services to private and corporate clients including wine advice and purchase, cellar management, VIP wine events and also exclusive wine tours. I have a range of individual and corporate clients. Examples of my work with corporate clients include my being Wine Consultant to the UK Houses of Parliament and Soho House Group (London), Soho House (New York), Mews of Mayfair, Oxford's Bar and many others. I also have other corporate clients such as hotels and sporting estates and clubs, including several football Premiership clubs. I am the author of Drinks (Dorling Kindersley, 2005), Top Ten Guides DK 2006) covering wine from France, Italy, USA, Australia and New Zealand. My latest book How to Choose Wine (DK 2006) was voted runner-up as the "best wine book in the world" at the 2008 World Gourmand Awards organized by Edouard Cointreau. My work with footballers and television is aimed at a younger audience, and although I have clients of all age groups, I also try make wine attractive and interesting to a younger audience, and to avoid the snobbery associated with wine in the minds of some people. I am consultant to companies like Descent International (luxury ski chalets) and Spiral Cellars, who aim their product often at younger or non-traditional markets. I have travelled to the USA, and to other parts of the world, and although I am French in origin, I have a comprehensive knowledge of wines from the "New World". 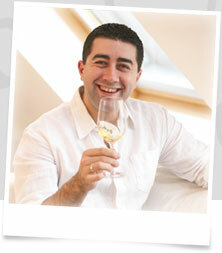 I was one of the first Master Sommeliers to promote "New World" wines in France. I have an English family, and I both write and speak English as well as my native French. April 1994 - September 1995 I was employed at the Restaurant Laurent, (2** Michelin) Champs-Elysees, Paris, first as Commis Sommelier and then promoted to Sommelier under Mr Philippe Bourguignon (Best Sommelier in France). 1992 - During this year I worked for four months as Commis Sommelier at Restaurant Le Doyen, (2** Michelin) Champs-Elysees, Paris. I also worked at the Jules Verne Restaurant (1* Michelin), Eiffel Tower, Paris and at Castel Marie-Louise (1* Michelin), La Baule on my first work experience.